May 21, 2018--A member of Delaware's Seashore Chapter of ANG introduced us to a type of backing board she uses when "finishing" her needlepoint into ornaments and the like. It's relatively thin (24 point board weight), making it easy to cut with scissors or a rotary blade; is certified acid free; and conveniently sized at 8.5" x 11" (each sheet is large enough to cut front and back of two ornaments). 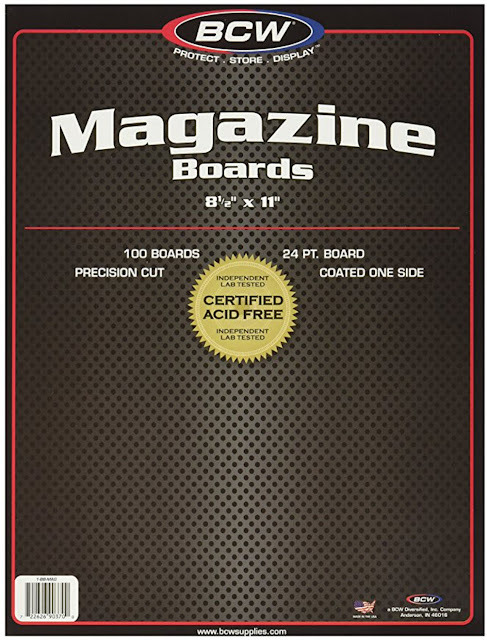 There are 100 boards per package and it's reasonably priced (found mine on Amazon.com). Of course, its original purpose is for use as backing to comic books and similarly sized magazines. Who knew. Thanks Linda C. for sharing this information. I've used these for years to wrap fabric I to mini bolts, cut templates, back framed needlework and ornaments, and several other uses. They are great!